Alpaca Clothing, Pima Cotton Tops, Nightwear, and Alpaca Knitwear from Spirit of the Andes. 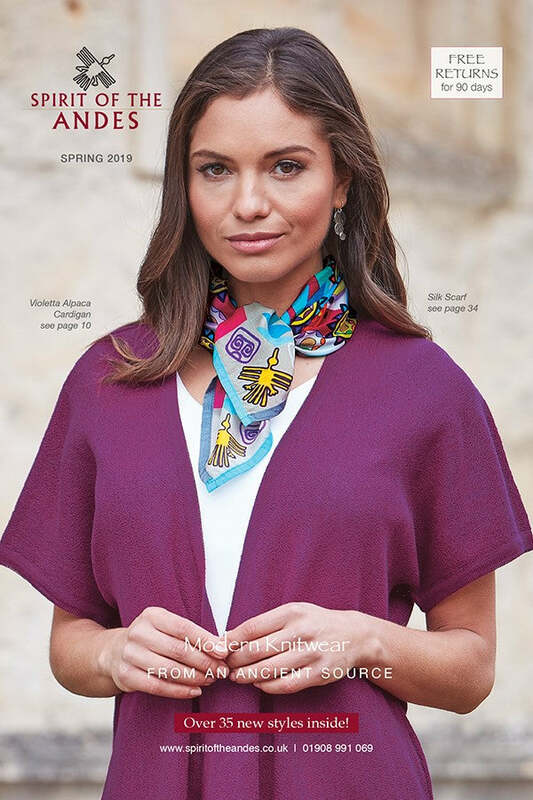 Established in 1993, Spirit of the Andes is the leading UK Clothing Brand in Alpaca Clothing, Pima Cotton T-shirts and Nightdresses, and Alpaca Knitwear. Andes Alpaca Wool and Pima Cotton are both exceptionally soft fabrics due to the high altitude locations a long way above sea level where we source our materials from. Our Pima Cotton and Alpaca Clothing is made by families of artisan knitters in Peru in South America. We work with them to provide for both their families and to provide their expertly knitted Luxury Alpaca and Pima Cotton Knitwear for our loyal customers in the UK and around the world. The vitality of our much-loved Alpaca and Pima Cotton brand and clothing has been renewed and restored by its current owners, whilst retaining the classic Alpaca Knitwear and Pima Cotton T-Shirt styles for which our discerning customers keep returning. We always include stunning new Alpaca Clothing designs in each of our new clothing collections to keep your wardrobe fresh and new. Our Pima Cotton T-Shirts come in a variety of different colours each season, and our Pima Cotton Nightwear collection is regularly refreshed and very popular around the world. You can shop with confidence on our secure website, or if you prefer you can call us with your order, or write to us either by post or by email. Our dedicated team looks forward to meeting and speaking with you to provide excellent service and the very best in Luxury Pima Cotton T-Shirts, Sumptuous Pima Nightwear, Cotton Nightgowns and Alpaca Knitwear.